After a couple of shows off I am very excited to be back for Snow White and the Seven Dwarfs. I will be performing as Lazy Dwarf – such a hard task! 😉 . I have been lucky enough to have been part of this company since 2003, but my first Pantomime was back in 2009 performing as Blusher (Dwarf) the last time we performed Snow White and the Seven Dwarfs. I am sure it will be a fabulous but also an emotional show. My first time performing at The Intimate Theatre was in Snow White, which will most likely be our last performance here too. We had an exciting and very busy week at rehearsals last week. Monday the Dwarfs and featured dancers were called for singing with Kate and Mike and choreography with Wendy to learn ‘Faith’ (you may recognise this from Sing!). This was such a fun song and dance to learn, so energetic and will be sure to leave you all grinning from ear to ear. During the evening there was a production meeting to discuss all the arrangements for the week such as lighting, set design and staging. We can’t wait to find out what they have in store for us all! Wednesday everyone was called at various time throughout the evening for a fun and jam packed agenda. From learning new songs, adding principals to songs previously taught to ensemble and also setting some of the last few remaining scenes with Chris. It has all come together so well, and I can’t believe that everything is nearly set. During the evening some of us met with Fay & Ellie for costume fitting, and I had fun jumping back into that Dwarf outfit again after so many years. We’re all really looking forward to setting our final pieces over the next few rehearsals and seeing them all come together in our first run (oh yes we are!). 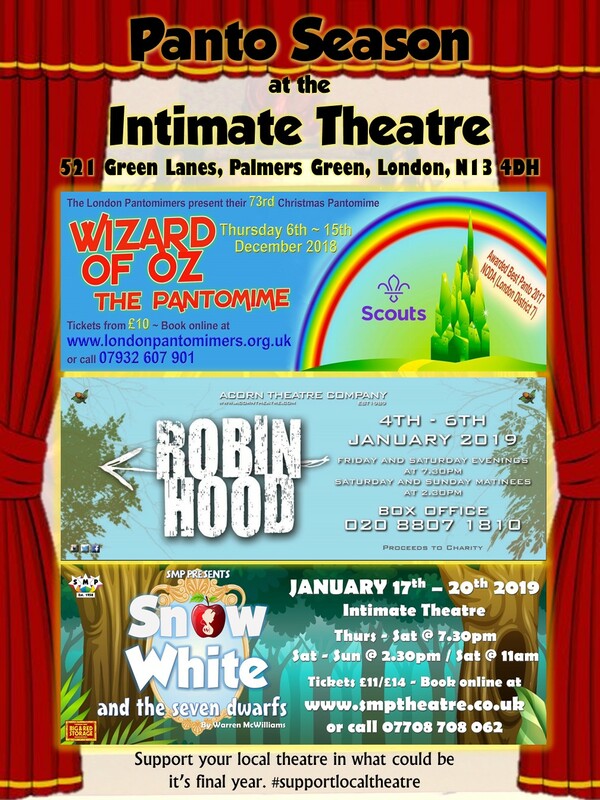 Snow White runs at The Intimate Theatre, 521 Green Lanes, Palmers Green, London, N13 4DH from Thurs 17th to Sat 19th January 2018 at 7.30 p.m. & Matinee on Sat 2oth & Sunday 20th January 2018 at 2.30 p.m. In addition, SMP will introduce an 11am Matinee on Saturday 20th with a show specifically tailored for our younger audience. What’s on at The Intimate this year? SMP in the Enfield Christmas Parade of Light 2018 – Route Map.